By Dr. Guillermo Zamora, Surgeon UAG, Dhom. Lic. For the Institute for Homoeopathic Medicine. The story begins about 14 years ago, when I was a little dissatisfied with the results of the method I was taught in the postgraduate school (the Kentian), I began to investigate other possibilities of obtaining a more exact remedy in my prescriptions. At that time, one of our teachers, who taught the aforementioned method, alluded to a small book of medical matter that she held in her hand, and affirmed that her father (the founder of the school) was very successful in his prescriptions thanks to that work. At that time I paid close attention to that book and wrote down all the details of the reference on a small piece of blank sheet. Time later, I began to read it and I realized that it was a medical matter that contained symptoms that were called “Keynotes” (Key symptoms) … something completely removed from the logic of Kent. Once I graduated, I decided to create a flowchart, which I organized based on the information contained in this work and some others that contained Keynotes symptoms. I arranged in different divisions corresponding for example to the locations, circumstances, Mentals, Sensations, Modalities, and many others. It took more than a year to finish ordering ALL the symptoms in this work. While I was doing the work I was impregnated with the keynote symptoms of this little book which I read and reread no less than 6 or 7 times, while my effectiveness rate improved day after day. It drew my attention that at some point the author quoted a certain Boenninghausen, at that time someone unknown to me, but as I divided my flow chart I began to realize that Keynotes were nothing other than COMBINATIONS of one location + one modality, or of a sensation with a modality, or even in some occasions, of a location with a sensation. For this reason, a little later I decided to get a copy of the Therapeutic Pocket Book (TPB), version 1846 of Boenninghausen. During the time I tried to use this copy, an English version, the truth is that I was very confused to use it; I did not have a clear idea of ​​how to use it, and I was not familiar with it either. Most of the time, I used my flow chart, and to a lesser extent Kent’s repertoire to consult some rubric. However, although the effectiveness rate had increased markedly (say 20 to 50-60%), I still felt dissatisfied with the result. One day, there comes one of those moments that you think you are not going to touch, and one of my children begins to get sick of the skin (Dermatitis), coming to present on one occasion Ritter syndrome (a disease caused by golden Staphylococcus) . Despite all my efforts, both in my diagram and through the use of Kent ‘s repertoire, only Rhus – T was thrown at me , which was in accordance with the recommendation of several international homeopaths whom I had asked for an interconsultation. If anything, the recommendation was made to use Sulfur as an alternative. Anyway, frustratingly these remedies did not give the desired result. It is then, that after having read some of his dissertations, and astonished by the content of them, appears on the scene Dr. Gary Weaver, President of the Institute for Homoeopathic Medicine, who selflessly and making use of his knowledge and expertise in The TPB, helped me with my son’s case. He told me that my conclusion of Rhus-T through my tools was logical and even close to the diagnosis, but that in reality the remedy was Sepia . Little convinced of his diagnosis, I followed every step in his prescription. The result that would come shortly after would be surprising; and a couple of remedy changes along the way would be enough to solve the case completely. Thus through this excellent homeopath I acquired knowledge really Hahnemannian method and I realized the great favors a good tool offers ( e s for this reason that translated the TPB of Polony & Weaver Spanish ). Today, Dr. Gary Weaver is still the person to whom I consult when I have problems in the family. Recently, another of my loved ones almost died (literally) from a kidney problem, and once I learned that when emotions are mixed, it is better to consult a colleague, he gave me an example of the success obtained when using a good tool in the correct way. During this learning process, I understood that in those combinations that I observed during the construction of my flow chart, the Keynote symptom was always made up of a part that was very consistent in the proving, and of another that was shared by few remedies ( as I now know that Guernsey claimed), and that most came from the Therapeutic Pocket Book of Boenninghausen. But I also realized that the TPB is built by the abstraction of symptoms from the provings and that it has the quality of being able to be used in order to recombine by analogysymptoms to obtain an infinity of combinations that have never even been seen before in a proving. That’s why we can deduce, that many combinations were out of those Keynotes. Therefore, it is also important to mention that this process of abstraction and recombination during the taking of a case has a specific methodology, which makes this repertoire a unique and indispensable work. Nowadays I use the Boenninghausen repertoire most of the time in my daily practice (95%), sometimes I consult my flow chart (4%) and very rarely (Kent’s repertoire) (1%). My effectiveness rate has been increasing, from 85-95%. You may ask: Is it possible to succeed using Kent’s repertoire? The answer is YES, but with a certain margin of error, and as long as we have an acceptable knowledge of Pure Materia Medica (and EC), we know what rubrics to use and what is the true method to take a case according to the Hahnemann guidelines. , who until now has only been misinterpreted and little investigated by most of the schools, even those that advertise themselves as very “Hahnemannian”. On the contrary, it is rare school that comes to support a seminar like ours, unique in its kind. What has happened is similar to the game of the “decomposed telephone” where a message that is given at the origin arrives completely distorted to the last receiver. By then, when we arrive with an apparently “new” message, but that simply was NOT taken into account (or was not known about it), interests are affected (school programs, homeopathic software, books, seminars, “dubiously experienced remedies that are for sale”, ie laboratories, etc. ) and then it seems that Hahnemann becomes repulsive to the “affected”, or in the more measured of the comments it is said that “Hahnemann and Boenninghausen are outdated”, as if science was a matter of fashion, and even more serious, as if they had been studied and researched. In short, that same conflict of interest in the BIG PHARMA (pharmaceutical industry) by which the homeopathic community tears so much of its clothes, is the same problem that you have at home. homeopathic software, books, seminars, “dubiously experienced remedies that are for sale”, ie laboratories, etc.) and then it seems that Hahnemann becomes repulsive to the “affected”, or in the more measured of the comments it is said that “Hahnemann and Boenninghausen are outdated”, as if science were a matter of fashion, and even more serious, as if they had been studied and researched. In short, that same conflict of interest in the BIG PHARMA (pharmaceutical industry) by which the homeopathic community tears so much of its clothes, is the same problem that you have at home. homeopathic software, books, seminars, “dubiously experienced remedies that are for sale”, ie laboratories, etc.) and then it seems that Hahnemann becomes repulsive to the “affected”, or in the more measured of the comments it is said that “Hahnemann and Boenninghausen are outdated”, as if science were a matter of fashion, and even more serious, as if they had been studied and researched. In short, that same conflict of interest in the BIG PHARMA (pharmaceutical industry) by which the homeopathic community tears so much of its clothes, is the same problem that you have at home. or in the more measured of the comments it is said that “Hahnemann and Boenninghausen are outdated”, as if science were a matter of fashion, and even more serious, as if they had been studied and really researched. In short, that same conflict of interest in the BIG PHARMA (pharmaceutical industry) by which the homeopathic community tears so much of its clothes, is the same problem that you have at home. or in the most measured of commentaries it is said that “Hahnemann and Boenninghausen are outdated”, as if science were a matter of fashion, and even more serious, as if they had been studied and really investigated. In short, that same conflict of interest in the BIG PHARMA (pharmaceutical industry) by which the homeopathic community tears so much of its clothes, is the same problem that you have at home. 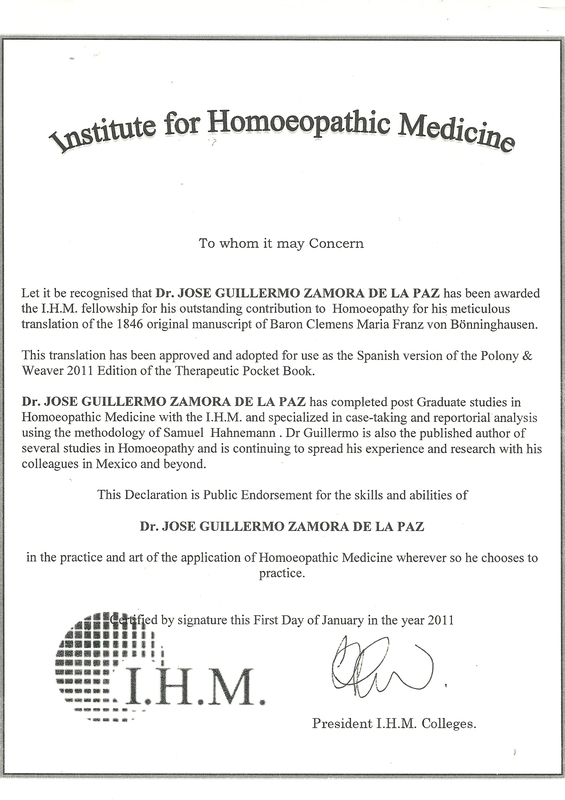 In the case of the teachers of the IMH none will teach a personal opinion, nor will teach philosophy, much less dare to tell you that they discovered the black thread or that they are the black thread as many modern gurus who are out there wanting self-proclaimed and that really AFFECT what is most important for a conscious homeopath; to his patients. The IMH teachers will only teach you genuine Homeopathy, as Hahnemann taught it and with which he cured tuberculosis, syphilis, pneumonia, psychosis, diarrhea, etc. etc. etc. … Haehl, R .: Samuel Hahnemann, His Life and Work, 1922, 2 volumes, Indian edition, BJain, New Delhi, 1985, vol.2, p.483. Only a few schools have made the decision to make a change in teaching, and only a handful of homeopaths have taken the decision in a personal and independent way to align themselves with the instructions proposed by Hahnemann by virtue of compliance with the principle of similar. Is it too late to restore what has been destroyed? This entry was posted in Admin Comment, Boenninghausen and tagged homoeopathy. Bookmark the permalink.